Discover the stories and history of the saddest era in American history, the Civil War from 1861 through 1865. With nineteen chapters and over 1500 pages of text, this unique compilation provides a stunning overview of the military strategies, campaigns, battles, and personalities of the war. 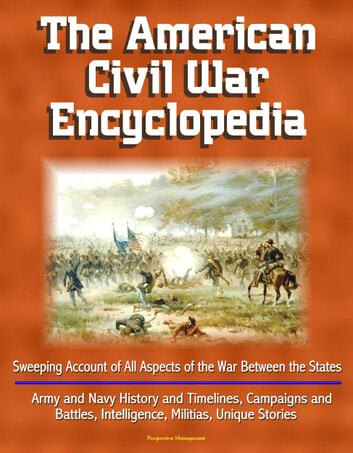 The encyclopedia opens with The Civil War at a Glance - organized yearly with authoritative chronologies - shows the course of the war from Fort Sumter in 1861 to Appomattox Court House and beyond in 1865. It is divided according to the two principal theaters in which the major military operations took place: (1) The Eastern Theater, roughly comprising the area east of the Appalachians in the vicinity of the rival capitals of Washington and Richmond, and (2) the Western Theater, primarily between the western slope of the Appalachians and the Mississippi River. Chapter 3 provides a detailed discussion of campaigns, starting with Sumter. Three-hundred and eighty-two major battles of the war are detailed in the next chapter, with information on alternate battle names, campaign, dates, principal commanders, forces engaged, estimated casualties, and full description. 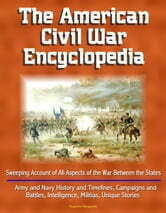 Chapter 5 is a thorough description of U.S. Army involvement in the war; chapter 6 provides detailed information about Naval engagements, including a naval chronology, bibliography, a vast descriptive list of confederate ships afloat from the U.S. Navy Dictionary of American Naval Ships, biographies of admirals, captains, and commodores, and colorful first-person historic accounts of battles. From a major DoD book on the American Experience at War, historians discuss the civil war. In the next chapter, an Army historian describes the opening clashes of the civil war in great detail. Intelligence and Spying in the Civil War is the subject of Chapter 9. The Civil War, like the American Revolution, was an occasion for widespread human intelligence operations, owing to the fact of an identical language and the shared cultural backgrounds of the protagonists. It was an easy matter to conceal allegiances and pass through the familiar countryside. It was also the brink of the modern era of warfare, employing new technologies like railroads, telegraphs, photography and lighter than air ships. This opened new avenues for intelligence exploitation. In the American Civil War the principal intelligence gathering arm of the U.S. Army was the cavalry. Early in the war, however, they could not be said to live up to the present-day motto of the Military Intelligence Corps, "Always Out Front." Rather the cavalry seldom ventured very far from its infantry and artillery support. Its sorties were marked by timidity, and therefore its usefulness as the eyes of the army was hooded. That is until the arrival upon the scene of a "Man on Horseback" - Brig. Gen. John Buford. Intelligence in the Civil War, by the Central Intelligence Agency (CIA), focuses not on the battlefield of the tragic war, but on a battle of wits.